Located within the Sapporo Ramen Alley, Aji No Karyu is known for its "Real Sapporo Ramen." No doubt an excellent Miso Ramen, you won't be disappointed with this one. And if you want to experience some great Hokkaido seafood at the same time, there's a ramen for that too. Take the Nanboku line to Susukino Station. From there it's just a 2-minute walk south and to your left. It's the first shop on your left when you enter the Sapporo Ramen Alley from the front entrance. Grab a seat and give the chef your order. With roots dating back to 1951, Sapporo's Ramen Alley in Susukino is inexplicably one of the best places to visit on this Earth. Okay so I'm a bit biased when I say that, but this alley is home to some of the best miso ramen in the world. With a total of 17 (yes 17!) ramen shops lining both sides of the alley, you can easily become overwhelmed when making your decision. But fear not, there's a reason why each one is here so just start from one end and make your way to the back. Shops are subject to change. Take the Nanboku line to Susukino Station. From there it's just a 2-minute walk south and to your left. You cannot miss it! The nearest station is Minaminagayama but don't count on getting here by train. You might be waiting for hours. The easiest way to get here is by car. Unfortunately, for most of us that means taxi and a one-way trip from Asahikawa Station can set you back 2,100 yen (~$21). There's always the option to walk, but that could take an hour in itself. Like I said before, the main shops for all of these ramen-ya's can be found within Asahikawa city so only go here if you really, really, really want to. I did. Ramen (or Raumen) House Aoba is the oldest ramen shop in Asahikawa. It reaches 3 generations deep and while the rest of the city has embraced the influx of tonkotsu-shoyu ramen, Aoba has stayed true to its roots with a pure assari-kei shoyu ramen made with the freshest blend of land and sea. You won't find any tonkotsu in this soup, which consists mainly of torigara, konbu, and various vegetables. The noodles are made fresh and it shows. 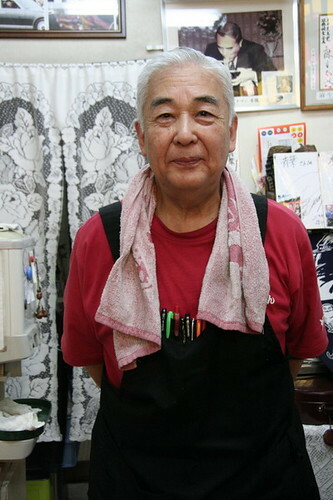 If you're lucky, you may even get to sit down and chat with the ramen master--Murayama-san. From Asahikawa Station head East away from the main shopping street and take a left on the next big street heading North. Walk five blocks and it'll be on your left. It's about five minutes from the station. They open at 9:30am and close at 10pm (9:30pm on Sundays). They are closed on Wednesdays. Grab a seat and try to embrace the history. Many of you regard Santouka as "The Best Ramen in LA!" While that may be true, wait until you try the original location in Asahikawa! It's not in a mini-mall, it's not in a food court, and it's not in a Mitsuwa. Although the "secret white soup" may not differ much in flavor, the freshness is immediately realized and it WILL make you smile. I only wish I could've tried everything else on the menu. The toppings were all 10x better than what I've had in the States and the noodles did not disappoint. From Asahikawa Station head East away from the main shopping street and take a left on the next big street. Walk one block and you'll see it on the left. It's barely a minute from the station. They open at 9:30am and close at midnight. If you go when they open, the toroniku might not be ready yet so just an FYI. Have a seat and wait for them to take your order. For lunch, they offer a free rice ball and salted plum. Make sure you only take one of each...hehe. If you ask anyone about Ramen No Hachiya, they either love it or hate it. Let me just say this: If you don't like a strong niboshi (fish) flavor, then you'll hate it. But if you like niboshi blended with tonkotsu-shoyu and burnt lard, you'll love it. I recommend going all out with the koi (strong) version of the Shoyu Ramen. It's pretty intense. The noodles are the typical starchy, thick, chewy type that Asahikawa is known for and they are delicious. From Asahikawa Station head straight down the main shopping street (between all the department stores). After ten blocks make a left and it will be on your left. Just look for the big sign. There are two entrances: One from the alley called ふらりーと and the other from the small parking lot on the other side. Grab a seat and wait for them to take your order. If I had to choose a favorite from my recent trip, Ramenya Tenkin would be very near the top. A two-day process of boiling pork bones (豚骨) and chicken bones (鶏がら) defines this top-notch soup. Add some thick shoyu that's derived from the chashu making process and viola!...The signature Asahikawa-style Shoyu Ramen is born. Almost everyone I talked to said Tenkin was their favorite. And that's some high praise in a city filled with great ramen shops on almost every corner. You get a free bowl of rice during lunch, but if you want to avoid the crowds I recommend you go around 2 or 3. From Asahikawa Station head right away from the main shopping street and take a left on the next big street. It's the street where you see all the taxi drivers entering their parking lot. Head north away from the station for seven blocks then make a right. Ramenya Tenkin will be on your left. Grab a seat and place an order with the waitress. They are open from 11am-9pm and closed on holidays. After 20 years of ramen training, the owner of Kushiro Ramen Kawamura finally set out to make a name for himself. He claims that his ramen has a flavor you can't get sick of even if you ate it everyday. The respectable shoyu ramen is a "simple" blend of torigara and onion that results in a refreshing (さっぱり) taste. The noodles are not homemade but "custom-ordered." It's quite possibly the most recognized and most recommended ramen-ya in all of Kushiro, but don't expect it to blow you away. It's billed as an "orthodox" shoyu ramen and is just that. I can eat it everyday, can you? From Kushiro Station head nine blocks directly south on Kitaodori (the main street leading to the river). Make a left on the street AFTER the big intersection where the 44 and 38 meet. In another block and a half, Kawamura will appear on your left. Walk in and place your order after taking a seat. They are closed on Mondays. Kushiro Ramen Ginsui is the kind of ramen-ya you would want in your neighborhood. The kind where you can relax, chat with old friends, and eat some great food. The shoyu ramen here is key, but I've heard the shio, miso, and pirikara aren't bad either. I ordered the Shoyu Chashu Men where you can choose between two types of chashu--fatty or lean. Of course I chose fatty and was surprised by its moist crunch. If you like an oily shoyu ramen made with torigara, katsuo, and konbu then you've definitely come to the right place. This IS Hokkaido! From Kushiro Station head nine blocks directly south on Kitaodori (the main street leading to the river). Make a left on the street AFTER the big intersection where the 44 and 38 meet. Then walk two more blocks and make a right. After another block you'll see Ginsui on your left. Wait to be seated and order from the waitress. They're open from 11am to midnight and closed on Wednesdays. If you go crazy for gyoza, then you may want to stop by the Ikebukuro Gyoza Stadium while visiting Tokyo. While there's plenty of gyoza specialty shops throughout the city, there's only one place where you can find 11 famous shops from all over the country of Japan in one spot. You might just call it the G spot. Haha...okay I'm stupid. It's located on the second floor of the Sunshine City building in the Namjatown theme park. From the JR Ikebukuro Station take the East exit and head East. I got lost so it's probably better if you find the nearest Koban (police station) like I did and get better directions. But it's definitely East from the station. Go early and go hungry. Craving something spicy? Then you've come to the right place! That's exactly how I was feeling when I first stepped foot in Mouko Tanmen Nakamoto. I was craving a spicy ramen and I obviously didn't know what I was getting myself into. The signature Mouko Tanmen is a tame 3 out of 5 stars on the spicy meter, but it still kicked my a**. The best part about this ramen is that it's not just spicy. It had a great texture, excellent flavor, and the noodles were thick and filling. If you're feeling brave, feel free to give the 5 star Hokkyoku Ramen a try. But don't blame me if you can't wake up in the morning. From Ikebukuro Station take the West (西) exit and head west on the main street. At the very next big intersection make a left and it'll be in a small street on your right. If you see arches that say グルメ道 (Gourmet Street) then you're in the right place. Walk up the stairs, order from the ticket machine, then wait for someone to point you to a seat. Everyone gets an individual packet of tissues, but it may be wise to bring your own towel. BELIEVE the hype! It's not just a white guy making ramen. It's a down-to-earth-passionate-about-what-he-does white guy making a uniquely traditional bowl of original ramen. Ivan Ramen is for real and you'll immediately realize that when you take a seat and meet the man behind the action--Ivan Orkin. I'm not gonna repeat his story, but when you witness his creativity and skills first hand, you'll understand. If it's your first time, order the shio ramen with everything on it. If it's your second time (trust me you will be back), order everything else. If you live in Tokyo and have never been or if you're new to Tokyo and too intimidated to enter other ramen-ya's...GO HERE! Take the Keio line to Rokakoen Station. From there it's about a two minute walk. After you exit, go up the stairs to your left and follow the street until you get to the major intersection. Make a left and you'll see it on your right. The line usually extends into the adjacent alley so be prepared to wait. Once you grab a seat, place your order and don't be afraid to say hi. It's only open for lunch on weekends. Check Ivan's website for the exact hours. If you get lost in Takadanobaba, you may never want to leave. Just ask this guy. Arguably lost in one of the best ramen regions of Tokyo, Yatai Ramen Takaryu is a refreshing gem that stands out from the others. Located in the shadows of Ramen Jiro, Takaryu is most known for their "Paichee Men"--a white chicken specialty. It's a clear salt-based novelty that may not blow your mind, but still open your eyes. Especially since there's so much signage to read. If you're looking for something clean and different, definitely stop by. You'll be happy. From Takadanobaba Station take the Waseda exit and head West. It's about a five minute walk down Waseda-dori. Once you see the Ramen Jiro on your right, make a left into the small street and then a quick right. You should see it on your left. If you miss it or it's too crowded (which I doubt) don't worry there's plenty of others to choose from. I love Ippudo, but I'm not sure what to make of this instant version. It's quite impressive that they've even tried to duplicate the famous bowl in this flash-fried version, but it's not what you'd expect. Or is it? It had all the components and was slightly more complicated to make than your average instant noodle. I don't know. It just didn't do it for me. I think I'll stay away from this one. I recommend you only try it if you're desperate for something quick and only have time to stop at 7-11 (in Japan that is). Even then, I'd probably prefer Goota. It caused more damage to my stomach than created joy for my mouth. Sapporo Junren is like the offspring of Sumire. I don't know the exact story, but somewhere down the line they branched off in an amicable split. The kanji for Junren (純連) even used to be read Sumire. Interesting, huh? This also explains their similarity in taste. Not that that's bad because they both make a mean miso ramen. Even this stuff in a box is tha sh**! The contents include noodles, menma, miso paste, and lard. Yes, lard is the key ingredient here. Without it you might as well throw it away. A little added bonus is this pack of "fresh" Sumire chashu I also brought back. No better time to eat it then now. *グツグツグツ* That's the sound of the miso paste and lard coming to a boil. Ouch! It splashed on my arm. If you do happen to be in the Yokohama area, the Shinyokohama Raumen Museum is currently featuring Ramen No Eki, a collaboration between Junren and Sumire. Go check it out! If you ever make it out to Yokohama, it's all about the "Iekei" ramen! Aside from going to the Raumen Museum, don't bother looking for anything else because Yoshimuraya's influence runs deep...real deep. Sugitaya is just one of many shops branched off from its famous parent. A typical "Iekei" ramen features a tonkotsu (pork bones) and torigara (chicken bones) mix with a special shoyu-dare that is highly top-secret. Order the ramen and top it off with a mound of green onions if you like. That's Sugitaya's specialty. Or just order the regular ramen and customize it to your preference. I recommend ふつう (pronounced futsuu), which means regular. They may ask you a few questions so just keep saying ふつう、ふつう、ふつう. The last question will be about the noodles. I noticed most of the people ordering it hard so if that's your thing just answer "katamen" to the last question. The noodles are thick and the soup is heav[enl]y. Be prepared to get full! From Shinsugita Station take the West (西) exit and walk north for about 3 minutes. It'll be on your left. Get a plastic ticket from the machine and grab an empty seat. If it's crowded (it usually is) then just wait patiently for one of the dude's in white to call you. After you finish your bowl, remember to put it up and use the nearest rag to clean your mess--and I'm not talking about your face! Trust me, that rag is pretty nasty...hahaha. Are you feeling バカ (stupid)? Then you've come to the right place. No, they're not trying to offend you but the several idiotic (baka) items on the menu might. I've never tried them but I've heard the toppings can get pretty crazy. If you're feeling relatively normal then it may just be better to go with the popular items like Hanjyuku Tamago Ramen, Iwanori Tamago Ramen, Chashu Ramen, or Fukuya Mentaiko Ramen. Or even just go with the simple Ramen like I did. It'll give you a good taste of tonkotsu without having to travel to Hakata. There's no ticket machine here so just grab a seat and yell out your order. 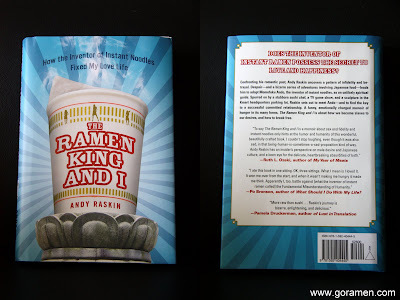 Andy Raskin's The Ramen King and I: How the Inventor of Instant Ramen Fixed My Love Life is on sale today in a bookstore near you. If it wasn't for this pesky eye infection I've been fighting (presumably from seeing so many amazing things on my trip), I probably would have read it by now too. In any case, the early reviews are very positive so be sure to pick up a copy of your own. Hopefully by reading this, my love life will be fixed too...haha.